Another Coles Catalogue that is designed to be a source for the deals of Christmas products is here with amazing things. Start discovering goodies on the very first page. 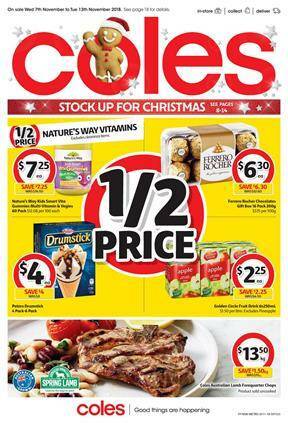 Nature's Way, Ferrero Rocher, Golden Circle, Peters Drumsticks, are half-price deals by Coles. Stock up for Christmas saving more than regular. With the special items, I am sure you will find something suitable for your taste. Coca-Cola, belVita, Infuzions, Cheezels, Cadbury Twirl, Kinder Bueno are among the snack products you should see. It seems to be a good decent catalogue for finding a profitable deal on beverage, too. For example, Coca-Cola 24x375mL pack. It is $19.50 which is a $11.60 cheaper price. Save over $15 on the beverage products on pg 2. Remedy organic kombucha is only $7 which will save your $2! More is available on pg 4-5. It's easy to spot Doritos special deal. Pay half for the Doritos crackers on pg 4. Another popular chips brand is Kettle. Potato chips of Kettle in 175g pack is only $3! Find Pepsi Max, Schweppes, Solo or more on pg 5. Chocolate boxes are the main products that are on sale in the Christmas shelf by Coles. These digital and online discounts are perfect choices for those who like to save and get the quality stuff at cheaper prices. Chocolate is a classic and tasty treat for many occasions like a new year celebration. Simple and quick meals and fudgy chocolate chip Chrissy cupcakes are on pg 11.